Reservation is an arrangement in Indian constitution which is committed to provide a level playing field for backward and underprivileged sections of the society. With time this arrangement became a vote guarantee scheme for the political parties and on their behest at several occasion this dirty politics have turned into bloodbaths. The reservation system on the other hand became so inept with the changing scenarios that its benefits never reached underprivileged and backward classes which resulted in more exploitation of these classes along with creation of uneven society. Jat Reservation demand was not new and such protests which have tendency to go violent were common occurrence from last so many years but this time Haryana government failed in controlling the agitators. The protest was not a mere protest but an organised mob rampantly attacking, looting and burning railway stations, police stations, buses, cars, trucks, malls, shops, etc, they also raped women during their agitation. Protesters even attacked army men and blocked their entry which forced army to open fire on them. The way these armed agitators were leading the protest in a planned manner were also hinting towards a backdoor organizer. Pressurizing government by cutting Delhi's food and water supply not looked like mob thinking. 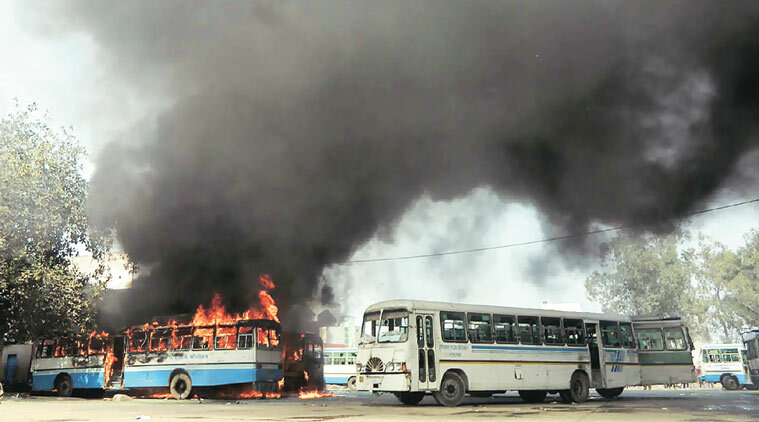 Haryana government’s wrong estimation of the intensity of the Jat movement made it uncontrolled. Victims of this violence accused police and government inaction behind the heightened protesters attacks. Comments of BJP MP Ram Saini about Jats added fuel to the fire which turned reservation movement into inter caste fighting. The protesters selectively destroyed non-Jats establishments. The agitation only ended when state government promised reservation and central government agreed to form a committee for the issue. This agitation episode and its outcome have set a wrong example by succumbing to the demands of violent agitators. Now others will also resort to such extreme protests while demanding anything from the government. Those behind the violence must be identified and punished harshly to teach a lesson to all those who think nothing wrong in damaging national property for personal gains. Armed mob of thousands destroying national property on state roads and streets are more dangerous for country's integrity than some vague slogans by a bunch of people in a city corner. This act of violence should be an eye opener not only for government but for all political parties who for time and again have used reservation to ensure their votes. In present political and social environment removing reservation is not possible but it is necessary to have different look to reservation process. It must be ensured that its benefits reach to the one for which it was intended. There are many upper caste people who make fake caste certificates for getting benefits of reservation depriving lower castes from its advantages and even in the lower castes only a small section is getting help through reservation. Most of all we must identify ourselves as Indians first and then with some caste, religion, region or race. National interest is higher than personal gains. Till next post God Bless India. Reservation should be restricted to the really deserving economically backward people. There are many affluent and very wealthy people enjoying reservation benefits...!